Heir to the Jedi – Ever Wonder What Luke Was Thinking? Have you ever wondered what Luke was thinking? Like when he blew up the Death Star, was he feeling relieved? Lucky? Cocky? Author Kevin Hearne gives us an extended look at the inner workings of the most famous farmboy from Tatooine in his adventures between A New Hope and The Empire Strikes Back. In his new book Heir to the Jedi, Hearne fills in part of the gap between when Luke was standing on the platform with Han and Chewie and when he first appears on the icy planet of Hoth. In between, Luke has somehow learned to manipulate a lightsaber by thought alone and has become more attuned to the Force. Without his mentor, Obi-Wan Kenobi, how has he developed those skills? I was fortunate enough to receive an advance copy from the kind folks at Del Rey before the book hit the shelves and in all honesty, I wasn’t sure what to make of this first person narrative. At first, I found myself questioning things like, is this the way Luke would really talk? Would he use words like this? It was distracting for me as I began to delve into the nuances of the story. But the more I read, the more I became enveloped in the storyline and the more that narrative voice made me feel like I was experiencing Luke’s trials and tribulations for myself. It was definitely a different take than Del Rey’s two most recent Star Wars books, A New Dawn and Tarkin, but like those books, this one helped us dive even deeper into Star Wars lore from a new perspective. While A New Dawn paved the way for the well-made and well-thought out Star Wars Rebels and Tarkin helped us to learn more about the Empire in the pre-A New Hope era, Heir to the Jedi takes a look at Luke and the Rebel Alliance just after the events of episode IV to get a better idea of how and why things were the way they were at the beginning of Empire. Nakari pulled out a noodle from her bowl and plopped it on the table between us. It lay there like an anemic grassworm. This cute interchange is part of the charm of the book. Hearne cultivates different relationships for Luke and at the same time helps us better understand how he developed in his skills. Just to let you know (I don’t think I’m ruining the book by any means – but noodle spoiler alert), Luke does move the noodle! And when he does, Nakari says, “Look at you, you little noodle scooter!” Totally cracked me up. 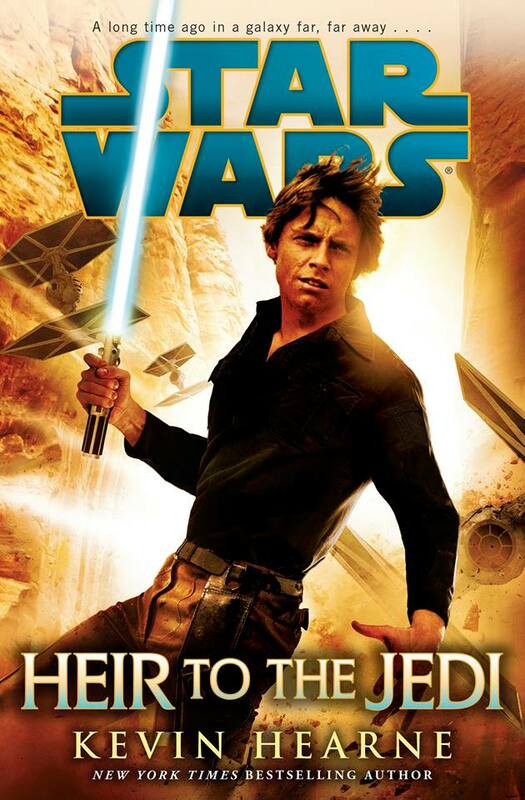 Heir to the Jedi is highly recommended for seasoned and new Star Wars fans alike. It combines a well-paced narrative with interesting and familiar characters, strong action sequences, and the thrill of the chase while at the same time giving us deeper insight into the character of Luke Skywalker. A thoroughly enjoyable book that builds in excitement from beginning to end. Previous Previous post: Run, Don’t Walk to See McFarland, USA! Next Next post: O…M…G…! Star Wars Rebels Pulls Off Best Season Finale Ever!